It’s not hard to believe that we’ve reached the point of a superhero ensemble in Netflix’s Marvel superhero series. 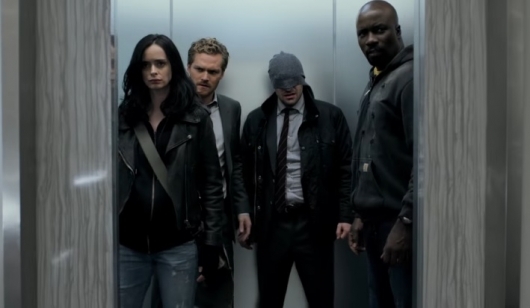 Daredevil (Charlie Cox), Jessica Jones (Krysten Ritter), Luke Cage (Mike Colter), and Iron Fist (Finn Jones) have all had a chance to tell their respective stories, some more than others, and now they are finally coming together to fight a common enemy. An enemy that has been looming over them since the start of Daredevil. With The Defenders is set to debut this weekend on Netflix, the streaming service has released a brand new featurette that will surely help fans and audiences get themselves hyped for the highly anticipated miniseries. Check it out here below. The featurette has some of the standard soundbites from that cast getting us excited for something that every Marvel fan has been waiting for. Keywords like “epic,” “thrilling,” and “awesome” are said. Of course, it wouldn’t be much of a featurette if it wasn’t hyping the show. Then there’s also the actors reminding us where their respective characters are now before they unite to become The Defenders. Cox says that at the end of Daredevil Season 2, his character is lost and that he’s given up being Daredevil. But deep down inside, he still wants to protect Hell’s Kitchen. We even see glimpses of him trying to get back on the path. And when he does, he comes to Jones’ rescue by telling Misty Knight (Simone Missick) that he is Jones’ Lawyer. Other highlights include Cage returning to Harlem. While he tries to figure out how he can help people, Claire Temple (Rosario Dawson) helps arrange a meeting with Rand, who is going through some struggles of his own. But when all of them realize that the very existence of New York is at stake, they will have to stop this ancient evil mystical power. So what will be interesting to see is how well they work together and can they manage to set aside their egos to defeat the Black Hand. The featurette reuses the same footage that we’ve seen in previous trailers. The hallway fight scene, all four Defenders in the Chinese restaurant. Sigourney Weaver, Elodie Yung, Jessica Henwick, and Scott Glenn also star. All eight episodes of The Defenders will premiere exclusively on Netflix on August 18, 2017.